← Goodbye Summer, Hello Autumn! We recently returned from a 2 1/2 week trip to Maine. We were able to spend the holidays with family and friends, and my 3 boys were able to experience playing in the snow for the first time! We had a lovely time and created precious memories. It was cold and cozy, and so festive! Our travel back to Maui was long and exhausting…We just barely missed a big east coast storm, and thankfully flights were held for us and we made it home on schedule. But traveling in the winter is hard! I was raised in Maine, but couldn’t handle driving in the snow on this visit. I was in awe of people living on the east coast, and how tough they are to handle such a long, hard winter. And then we woke up on Maui….and the sun is shining, the birds are singing, and the weather is mild and lovely. We are enjoying the ease of running outside barefoot, picking lettuce from the garden, and taking a trip to the beach when we feel like it. And my oldest boy is working on convincing his grandparents from Maine to move to Maui! There are of course trials that come with living anywhere, it just seems that here there are so much fewer weather woes! So i visited our central garden right away when we arrived home and saw it covered in 2 foot tall weeds. But i was still able to harvest green beans and kale, and we have basil bushes everywhere. But i have started more seeds, so that in a month we will be transplanting again. I have two lettuce beds that are doing amazing. Two different types of romaine that are loving the cooler winter weather. Usually lettuce bolts before we can enjoy it at all, but right now we have lots of lovely lettuce to enjoy! We also just harvested a good bed of carrots that are tasty and fun for the boys. I’m so excited to be in the garden weeding and getting ready for another planting. It really never ends here, the cycles of planting, growing, harvesting, weeding, etc. Sometimes it’s overwhelming, because there’s never a rest…But these winter days are lovely, with a slight chill in the air and the sun shining down…It inspires us to want to be outside all the time! 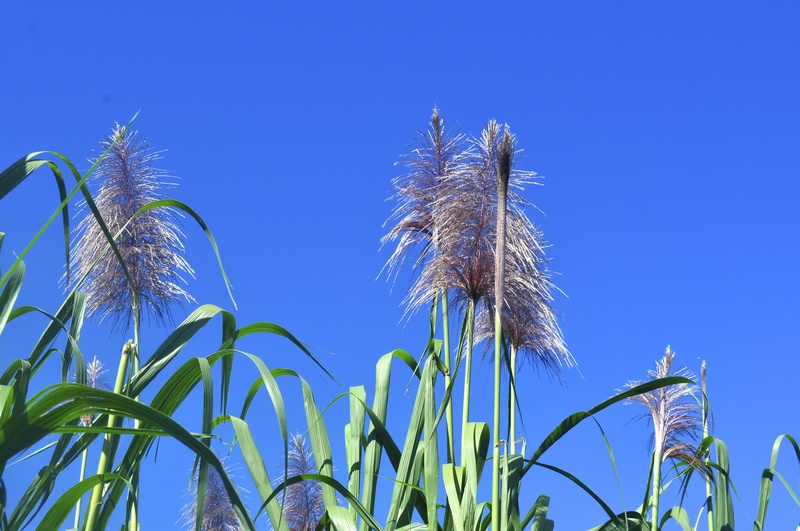 I did not know sugar cane produces such a lovely flower….